Commercial truck driving accidents involving semi-trucks and 18 wheelers are often very different from vehicle accidents involving cars, lightweight trucks, SUVs, minivans, and much smaller vehicles. Semi-truck accidents tend to be much more severe because of the size and weight of the trucks involved. When an 18 wheeler crashes into a car, the car and its passengers and driver stand little chance against the truck. As a result, drivers and passengers of vehicles hit by large commercial trucks have a higher rate of death and serious injury than those involved in crashes with similarly-sized vehicles. Hours of Service Regulations. The hours of service regulations are comprehensive regulations governing the amount of sleep and rest that truck drivers must have. In order to ensure compliance with these regulations, drivers must maintain logbooks, or electronic records, to document the dates, times driven, and other information. Prohibition on the Use of Alcohol or “Pep Pills”. Truck drivers may not drink alcoholic beverages within four hours prior to driving, and they may also not use “pep pills” or similar stimulants/drugs (even though such drugs otherwise may be legal). Vehicle Inspections. 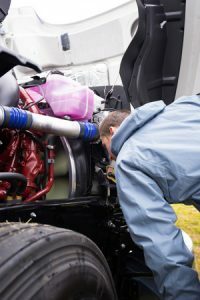 Truck drivers must inspect their vehicles carefully prior to driving, and at certain other prescribed points, and must document such inspections. Training and Safety. Truck companies must train and ensure their drivers are familiar with the rules of the road, including federal trucking regulations, and must not promote or ignore safety violations. The foregoing are only a sample of key FMSCA regulations, all of which do not apply to non-interstate commercial driving. Were the Truck Drivers and Trucking Companies in Compliance with FMSCA Regulations? In a truck crash, it is important to obtain all inspection, safety, and driver records relating to the accident as soon as possible after an accident. We want to know if the truck driver or trucking company violated any applicable regulations, as this can show a course of conduct to engage in intentionally reckless driving. In some cases, truck drivers violate Hours of Service regulations and forge log book information concerning their driving so that they can earn more money by driving more hours than are allowed. Interstate commercial truck drivers and companies must maintain general liability insurance of at least $750,000 on every vehicle weighing over 10,001 pounds (in some cases, such insurance requirements may be as high as $5 million, depending upon the type of cargo being hauled). This amount is significantly above the amount required by most states, which tends to be around $50,000. The benefit of this insurance coverage is that those severely injured in commercial truck accidents, and the families of those who lost a loved one due to a commercial truck accident, may have a significant financial source from which appropriate compensation may be obtained. We offer a free, no obligation consultation, and once we learn about the nature of your case we can provide you with our advice concerning seeking recovery. We are tenacious in the representation of our clients, and demand full and fair compensation from all those responsible. Please call us today so that we can begin immediately working on your case upon being retained.